Includes 3-hours of sailing on Bellingham Bay and full dinner. Drinks are available for additional charge. Combine your tastes for adventure and delicious food on a 3-hour dinner sail on Bellingham Bay. Work up your appetite as you assist the crew in the raising of the largest mainsail on the west coast of the United States. After the sails are up, sit back and enjoy views of the beautiful coastline and enjoy an alcoholic or non-alcoholic beverage from the ship’s bar as you glide across the bay. 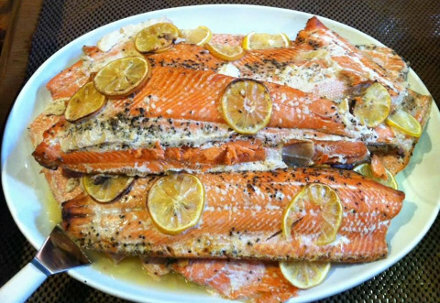 Our professional chef will ring the galley bell and a northwest meal of locally caught salmon accompanied by a rotating mix of seasonal salads and side dishes will be served buffet style. Passengers can also tour below decks which feature the ship’s navigational charthouse, modern galley and spacious salon. The Zodiac will glide across the water and explore the storied waters of Bellingham. 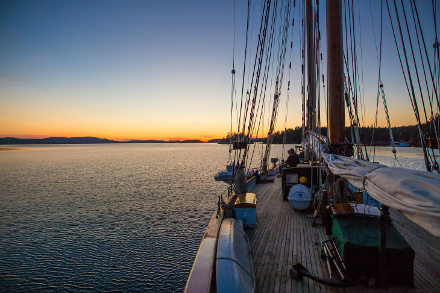 After eating heartily, enjoying craft libations and being transported back to the age of sail, the crew will begin to lower sails as the sun sets over Bellingham Bay. The ship returns back to the Bellingham Cruise Terminal at 9pm. * All cruises depart from and return to the Bellingham Cruise Terminal except where indicated.